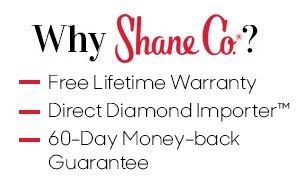 The History Behind the Diamond Birthstone - Shane Co. The diamond. A timeless symbol of love and the special birthstone of those born in April. It’s safe to say that many are envious of this birthstone, and it’s easy to see why. Its iridescent sparkle and shining reputation are enough to make the other months of the year jealous. 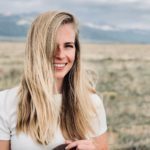 Adapted from the Greek word “adamas,” meaning “invincible,” diamonds are one of the hardest substances in the world and are thought to be unbreakable. But why is April lucky enough to call this gemstone its own? Luck may in fact be the reason. No one really knows how certain months became associated with certain gemstones. Over time, gemstones were linked with zodiac signs and in 1912, each stone was officially associated with a specific month of the year. Diamonds were believed to possess extraordinary healing powers and were even thought to cure illnesses linked to the brain. In ancient Greek history, it’s said that the diamond made a warrior unconquerable. 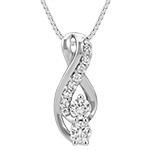 Naturally, diamond jewelry is the perfect gift for the special person in your life celebrating an April birthday. 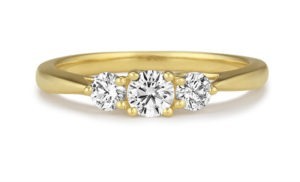 With its unmatched sparkle and brilliant history, it’s sure to be a gift she’ll love. 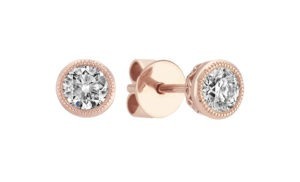 These bezel-set diamond earrings in 14k rose gold are stunning and would make the perfect birthday gift. 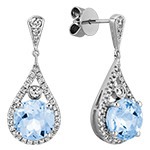 Expect these earrings to become her staple piece and a part of her everyday look. Perfect for a night out on the town, this gorgeous three-stone diamond ring in 14k yellow gold will make the ultimate statement. Give her a gift that sparkles just as much as she does. 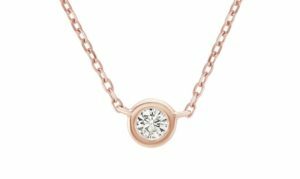 Celebrate her birthday with this sparkling 14k rose gold bezel-set diamond necklace. 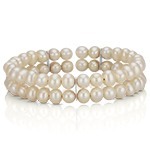 It’s a piece that will go with every outfit, and she will be reminded of you each time she wears it. Our diamond jewelry features hand-matched diamonds, ensuring the most sparkle. We uphold the highest standards of business ethics for ourselves, our vendors and our suppliers through the Kimberley Process. This ensures that all of our diamonds are conflict-free diamonds. We also protect our customers and preserve our integrity by only selling natural and pure diamonds. We do not sell any synthetic or lab-created gemstones of any kind. 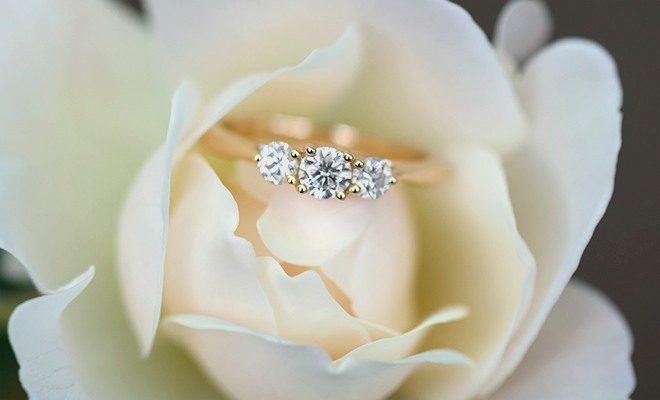 Shop our diamond jewelry here.